* These delicate Cubic Zirconia Wedding Earrings by Mariell are 1" h x 3/4" w and feature clusters of dainty marquise. * Using top grade CZ's plated in Genuine Platinum based rhodium, these pierced earrings have the rich look of fine diamond bridal jewelry. 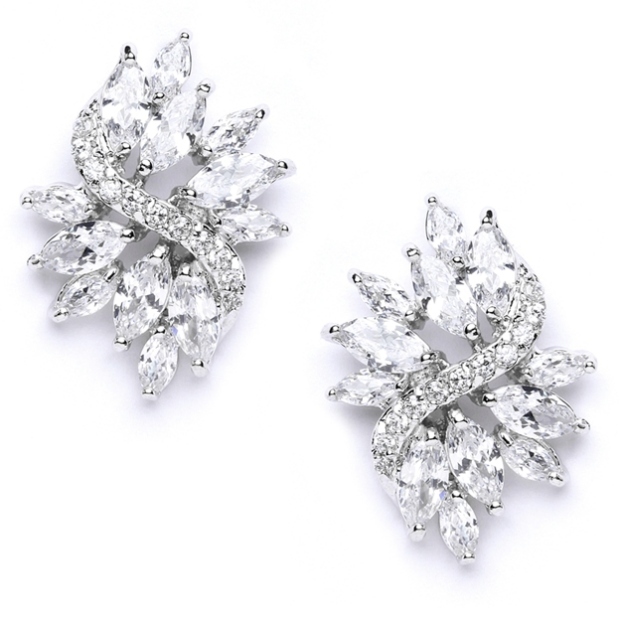 * Mariell's glistening Cubic Zirconia Bridal Earrings are crafted with dainty clusters of marquis-shaped CZ's. * These elegant genuine Silver Rhodium earrings are also available in a lustrous gold tone. * These pierced earrings have matching bracelets sold separately in either a petite length (6 1/2") sold as style 4014B-S-6 or a regular length (7 1/2") as style 4014B-S-7.